The Wildfire Killer... looks smug, doesn't it? With the launch of the Desire X, HTC confirmed it will now only be using two brand names. 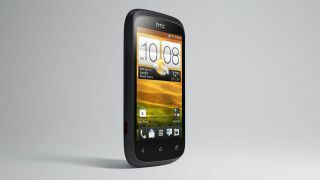 The HTC Wildfire and Wildfire S have been incredibly popular for the Taiwanese brand at the budget end of the scale, but since the release of the low-spec HTC Desire C there's seemed to be very little room left for the incendiary range. And at the launch of the Desire X, Graham Wheeler, director of commercialisation product management at HTC, confirmed that there would be no more Wildfire handsets for the time being. While he didn't rule out bringing the range back at some point in the future, the brand's decision to release fewer handsets and simplify its line of handsets means there's no room at the inn for the old Wildfire handsets. The Wildfire name itself was interesting, coming as the winner of a poll to decide the name of a new HTC phone on Facebook - it could have been the HTC Festi, Zeal or (shudder) Jovi. It's going to be interesting to see how the HTC Desire X fares against the likes of the HTC One V and One S – Wheeler dubbed the One series as 'superphones' while the Desire range are 'just smartphones'. However, given the fact the Desire range still packs a strong design ethos and Beats Audio, as well as a more powerful processor in the case of the Desire X, there could be confusion for consumers with two HTC handsets competing for the same space.